This project is most exciting; the image gives the impression of a more pleasant, brighter centre to a town that sorely needs attention. If only we could sort out the Rose and Young site! Such an eyesore! ABC – (A Better Caterham) is holding a Public Consultation with a display in each of the libraries; one in the Valley in Stafford Road, the other on the Hill in Westway. This will run from February 13th for two weeks where plans and details of the scheme will be on display. There will be an opportunity for you to comment by completing a questionnaire. The scheme will make the focal point of the Valley less cluttered whilst maintaining a high level of public safety. This work is scheduled to take place from the middle of 2010, during the school holidays. 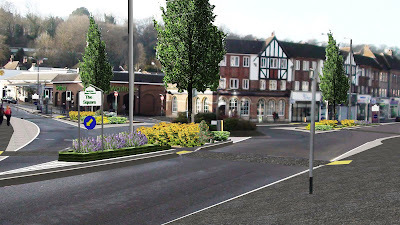 Random Greenway (Architects) is assisting us and Surrey Highways with this project. 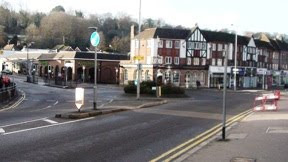 ‘The Square’ scheme evolved from the ‘Shabby to Smart’ (S2S) programme, being an integral part of this project , enabling us to achieve significant funding from SEEDA (South East England Development Agency), with matching contributions from Surrey and Tandridge Councils, together with the Valley and Hill Parish Councils. Work on ‘S2S’ began early in 2010, this being identified as a core action from the ABC public consultations two years earlier. Included is a range of new street furniture and other items in key areas in both the Hill and Valley. Bins, planters, signs, railings and seats are part of the programme and will be replaced or refurbished. The exercise is the result of a team working on details with different groups, including residents, businesses, plus officers and councillors from the Tandridge District, Caterham Hill and Valley Parish Councils. Pamela Cosgrove and Nigel Wilkinson are leading this group supported by Scott Coughlan at Tandridge DC. Street lighting was also identified as part of the improvements, although not included in this first phase. With the introduction of a new PFI (Private Finance Initiative) by Surrey County Council we have been informed that our street lighting will be replaced with more powerful, energy efficient lighting. The Project - A Better Caterham (ABC), aims to improve the area by involvement of local people and has followed guidelines by SEEDA (South East England Development Agency). Caterham was sponsored to participate as one of just 6 Surrey Towns by Tandridge District Council and Surrey County Council. Local people ran the exercise, called a ‘Healthcheck’, on a voluntary basis. Getting strong community involvement dramatically improved the case for grants towards local projects from various sources. The overall project began in the spring of 2006 and has involved over 100 volunteers to date, plus local councillors, council officers and some external helpers, all of whom have supported this exercise. ABC'a first phase of its life is nearing completion, so what next? Longer term plans for further developments are under discussion. Random Greenway has come forward with a comprehensive vision of what a long-term forward plan could achieve in terms of enhanced shopping areas and associated traffic management for both the Valley and Hill. These are beyond the scope of what we intend as a first set of improvements but are very helpful to set out “A Future Caterham”. The cost of such proposals would be several million pounds; however we endorse this set of ideas as a statement of direction and now seek to identify ways to fund elements of that. Whilst we still use the initials ABC and S2S, by which this work is known, the organisation behind it has now moved on to become a legal entity, registered at Companies House called The Caterham Community Partnership Ltd (CCP).